Elm Tree Lodge Guest AccommodationWelcome to Elm Tree Lodge Guesthouse, a family run B&B situated in Keswick. We provide very high quality bed and breakfast on a year round basis and have 3 en suite rooms, 2 doubles and a twin and a double with a private luxury bathroom. Our AA 4 stars assures that you will have a very exclusive stay with us. We also have off-street parking for 2 cars, secure password protected Wifi and flatscreen digital TVs in each room. All our rooms have been furnished to the highest standard and we have strived to create as pleasant an atmosphere as possible. We want you to enjoy your stay with us in comfort and style. The en suites are equipped with showers, heated towel rails, huge mirrors and shaver sockets. The double room with private luxury bathroom has a hand basin in the room and exclusive use of a bathroom equipped with a modern walk-in shower with a vertical shower tower that has double shower heads and twin body jets. All rooms have tea and coffee making facilities and biscuits provided as standard, along with a stylish 19" flatscreen digital TV, fluffy white towels, a hand towel, a hair dryer and an alarm clock. There are also chests of drawers, bed side cabinets and hanging rails provided in each room along with a chair and a full length mirror. Family-run AA 4-star guest house for high quality bed and breakfast. Arrival preferred after 16.30, other times by arrangement or ring in advance. Departure before 10.00. Baggage storage available if required. Elm Tree Lodge sometimes limits bookings to 3 or more days. Approach from A66/Ambleside/Penrith. Head into town centre along A591. Pass garage, postal depot, ambulance depot, all on left, continue another 250 metres. Turn left immediately before pedestrian crossing and immediately left again, Southey Street, take third left, Helvellyn Street and first right, Leonard Street. We are third property on the right. A small family run, friendly B&B. 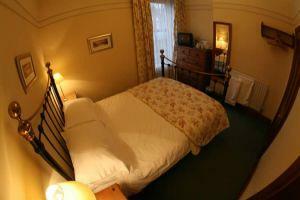 Clean comfortable room, nice quiet location within easy walking distance of the local town. Breakfast is to die for, and Tim couldn't do enough to make my stay more enjoyable. Have already booked my next stay.